You can access the Preferences window by clicking on the Preferences button which is either in the bottom-left corner of the RawTherapee window, or the top-right one, depending on your Editor tab mode layout. The About button opens a window which contains a splash screen, technical details of the specific RawTherapee build you're running, credits, licence and release notes. Please include these technical details when filing a bug report. Remember that if you simultaneously open several images each in its own Editor tab, each tab and instance will require a significant amount of RAM. Only use multiple Editor tabs if you have quite a lot of RAM - exactly how much depends on what resolution your images are, which tools you use, how many other programs you run in the background, and so forth, however a rule of thumb could be to not use multiple Editor tabs unless you have more than 8GB of RAM. A restart is required for these changes to take effect. Curves include adjacent buttons for copying, pasting, opening and saving the curve, and some include buttons for placing a node on the curve by picking a sample from the preview and for setting numeric in/out values. This option lets you decide where these buttons will be positioned relative to the curve widget. Position the main histogram in the left panel above "History", or in the right tool panel above the tools. The filter and ratings toolbar (4) can be shown in the Filmstrip. The Filmstrip is a narrow panel which you can toggle to appear within the Editor tab. It contains thumbnails of the images in the currently opened folder, along with the filter and ratings toolbar. It can be useful to see the Filmstrip while working in the Editor tab, but you can hide it if you need the extra vertical screen space. Use this option to show or hide it. Note that you can also toggle its visibility from the Editor tab by using the "Toggle the visiblity of the Filmstrip's toolbar" keyboard shortcut. Disabled, great for low-resolution screens. Enabled, requires that the screen has a high enough resolution to fit all the elements horizontally. Enable this option if you have a high resolution screen to merge all the toolbars at the top of the File Browser tab into one. You can hide the vertical scrollbar from the toolbox to save a little horizontal screen space. Use the mouse scroll-wheel to scroll when the scrollbar is hidden. If you have a few favorite tools which you would like to always see expanded, you can expand them now, hide the others, then return here to Preferences, disable "Automatically save tools' collapsed/expanded state before exiting", click "Save tools' collapsed/expanded state now", and click "OK" to close the Preferences window and commit your changes. Alternatively, if you would instead like RawTherapee to remember which tools are collapsed and which are expanded at the end of every editing session, then enable "Automatically save tools' collapsed/expanded state before exiting". Select a language for the user interface. "Use system language" will try to auto-detect your language based on environment variables. You can override the auto-detected language by selecting one manually. 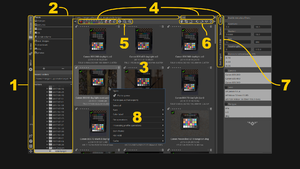 The Image Editor tab showing: (1) the preview background, (2) the crop mask, (3) lockable color pickers and (4) buttons which toggle the color of the preview background between black, white and theme-based. Choose a theme for the user interface. Although you will see theme-related changes as soon as you hit the "OK" button, you need to restart for the changes to take affect correctly. The way human vision perceives colors depends on various factors, of particular importance to this paragraph are the properties of the area which surround the observed region. The way you perceive the colors of a photograph viewed on a screen depends in part on the colors of the area surrounding the photograph. You can read more about this in the CIECAM02 article. In order to mitigate the errors the user makes while adjusting a photo, RawTherapee ships themes which use neutral background colors. While all of the themes are based on shades of grey, the theme which is most suited to avoid affecting human perception is "TooWaGrey - Average Surround", available from version 5.2 onward. Choose a custom main font, and a font for the Lockable Color Picker in the Image Editor tab, marked "3" in the screenshot. Some users will find the default font size too small or too large due to their screen resolution and DPI setting. You can fix that by changing the font size. 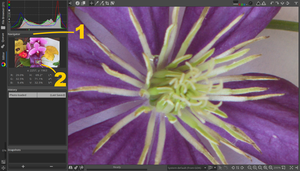 Adjust the color and transparency of the area outside of a cropped region, marked "2" in the screenshot. By clicking on the colored button, a new window appears where you can select a standard color or click on "Custom" to specify a new color. The vertical axis adjusts hue, while the horizontal axis adjusts transparency. Partial transparency is useful as it allows the cropped-off part of the photo to remain somewhat visible (2), so that you can move the crop around to find the best composition (hold the Shift key and move the crop with the mouse). The Image Editor tab showing: (1) the Navigator panel, (2) the Navigator guide which marks the area currently visible in the main preview when zoomed-in. Adjust the color and transparency of the frame (marked "2" in the second screenshot) visible in the Navigator panel (marked "1") when the main preview is zoomed-in. Imagine you are viewing a high resolution images while zoomed-in to 100%. In order to pan the image around the screen you would have to make multiple mouse movements (or have a very large mouse pad). RawTherapee saves you from this by using "pan rate amplification" - when set to 5, RawTherapee multiplies every pixel you pan by 5. If you'd normally move the cursor 500 pixels in one comfortable mouse movement, you will have panned 2500 pixels with this option set to 5. The effect is most visible when you are zoomed in, and least visible when zoomed out. When "Remember zoom % and pan offset" is enabled, when you open the next image RawTherapee will try to show the same area at the same zoom level as the current image. This only works in "Single Editor Tab Mode" and when "Demosaicing method used for the preview at <100% zoom" is set to "As in PP3". RawTherapee can send the processed image directly to an external program, e.g. an image editor, an image viewer or a script. This is done using the "Edit Current Image in External Editor" button in the Editor tab under the main preview - see the Saving article. It is here in Preferences where you can customize which program the processed image is to be sent to when you click the button. GIMP - This option tries to run the following executables in the following order: gimp, gimp-remote. They should be accessible using the $PATH environment variable. Custom command line - Write the full path to the executable including the executable. You may need to enclose the whole line in double quotation marks if you need to pass arguments, see the example. Variables such as ~ and environment variables such as $HOME are not supported. The above command opens the image in a single instance of Geeqie. Note that you need to enclose it in double quotation marks because you're passing the "--remote" option. The above command opens the image in Luminance HDR. No arguments or options passed so no quotation marks needed. GIMP - This option tries to run the following in the following order: open -a GIMP, open -a GIMP-dev. Photoshop - This option is hard-coded to "open -a Photoshop". Custom command line - Write open -a "External Program" where "External Program" is the name of the program to be used to open the image. Surround the name of the program in quotation marks if it contains one or more space characters. open -a "Adobe Photoshop CS6"
The above command opens the image in Adobe Photoshop CS6. Note that you need to enclose it in quotation marks because it contains space characters. open -a "Affinity Photo Trial"
The command above opens the trial version of Affinity Photo. It too needed to be enclosed in quotation marks due to the spaces in the name. open -a "/My stuff/Programs/Pixel Mixer"
The command above opens a program called "Pixel Mixer" in the "My stuff" folder. We have reports that it is not necessary to write the full path to the program even if it does not reside in the standard /Applications/ folder. Photoshop - Point RawTherapee to the folder which contains the Photoshop executable, Photoshop.exe. Custom command line - Write the full path to the executable including the executable. Don't worry about spaces or about escaping backslashes. Environment variables such as %ProgramFiles% are not supported. Specify which profile RawTherapee is to use when opening a raw or non-raw photo. The default processing profile for raw photos as of RawTherapee 5.4 is "Auto-Matched Curve - ISO Low". The default processing profile for non-raw photos (such as JPEG, TIFF or PNG) is "Neutral". The "Neutral" profile just loads the photo as it is, without applying any changes. To have processing profiles you have made yourself appear in the list, save them to the "profiles" sub-folder within the "config" folder. You can find out where it is on the file paths page. The special entry "Dynamic" activates the support for Dynamic Processing Profiles. When you right-click on a thumbnail and select "Processing profile operations > Reset to default" RawTherapee will apply whichever processing profile is selected as default for that image type. If the default is set to "Dynamic", then RawTherapee will run through the dynamic profile rules to generate a profile dynamically. Choose whether you want RawTherapee to store the processing profiles next to the input file (the default behavior), to a central cache, or both. It is a good idea to save the processing profiles next to the input files, as that lets you easily backup and handle your photos and their associated processing profiles. RawTherapee will look for processing profiles alongside the images, and in the central cache. If a profile exists in both places and they are not identical, this setting allows you to choose which one should have the deciding say. Specify the location of your Dark-Frame, Flat-Field and HaldCLUT Film Simulation folders. This section lets you decide which guides are shown when the crop is _not_ being manipulated. "Original" means the guide type currently selected, so for example if you would like to see the "Rule of Thirds" guide while dragging a crop, and to have the guide automatically disappear once you are done dragging the crop, then set this option to "Frame" or "None". Once a crop is in place, RawTherapee can automatically zoom the cropped area to fit the screen if you enable this option. Here you can define your custom rules for creating Dynamic Processing Profiles. At the top you can define the image directory to use at startup. It could be the RawTherapee installation directory, the last-visited directory, the home directory, or a custom directory. These options determine which information is visible in the thumbnails and how it should be displayed. Adjust the grouping of the right-click context menu in the File Browser (and Filmstrip). Choose which files are recognized as images and displayed in the File Browser. All supported extensions are set by default, except for PNG which is disabled by default. If a desired extension is missing you can easily add it by clicking the "Add" button. Some users reported that their Parsed Extensions panel is empty. This could happen after updating from an unspecified older version of RawTherapee. If your parsed extensions panel is empty, we recommend you close RawTherapee, then find and delete the "options" file. The next time you run RawTherapee you will be using the latest defaults, and your list of parsed extensions will contain all supported formats. To understand this section, first read the Cache article. The typical user should not need to change these defaults. The maximum thumbnail height decides how large you can make the thumbnails. Each thumbnail is stored in RawTherapee's cache folder and requires disk space, so keep this in mind if you increase the default size. The maximum number of cache entries decides how many of these cached files are kept before the oldest ones are deleted once the limit is reached. You can manually clear elements of the cache using the "Clear" buttons. You could "clear all cached files except for cached processing profiles" when updating RawTherapee to keep your disk clean and benefit from new cache-related improvements. Use the "Directory containing color profiles" button to point RawTherapee to the folder which contains color profiles. Set the "Default color profile" to the ICC file you generated when calibrating and profiling your monitor. You can have RawTherapee try to auto-detect the profile by using the "Use operating system's main monitor color profile" option. In Linux, the _ICC_PROFILE X11 atom is used to automatically find the monitor's ICC profile. Since there is only one such atom, and it is used by the "main" monitor, automatic detection is also limited to the main monitor, though you can copy multiple ICC profiles into the standard location and then you will be able to manually select them under the preview in the Editor. One very simple way of "installing" a monitor profile in Linux so that the atom gets set correctly is using DisplayCAL, via the menu "File > Install profile". If the result is "_ICC_PROFILE: no such atom on any window", then the atom is not set. If the result is a bunch of numbers, then it is set. In Windows, right-click an ICC (or ICM, they're identical) file and select "Install profile" in the context menu, or search for "colour management" in the Start menu. Rendering intents and black point compensation are explained below. The monitor profile must be of the "device" class in the RGB colorspace. You can select here the color profile of your own printer or your print service in order to simulate the rendering of the printed image. The printer profile must be of the "output" class in either the RGB or CMYK colorspaces. See below for Black Point Compensation. The "Rendering intent" drop-down lets you choose how the ICC profiles are used for translation between gamuts or color spaces. When in the "Monitor" section, the "source" is the color space within which lies the image data at the end of the pipeline before being put into the monitor profile's color space, and the "destination" is the selected monitor profile's color space. When in the "Printer (Soft-Proofing)" section, the "source" is the image data at the end of the pipeline, and the "destination" is the selected printer profile's color space. Colors from the source which lie outside the gamut of the destination color space will be shown using the nearest in-gamut color without affecting other in-gamut colors. The white point will be corrected. This is the default option and works with all profiles. Colors from the source which lies outside the gamut of the destination color space will be compressed into the destination's gamut at the expense of also affecting in-gamut colors. 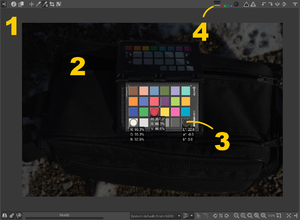 How the compression is performed is up to the gamut mapping contained within the color profile - it usually involves desaturation, and sometimes even hue shifts. The perceptual intent only works with LUT profiles which contain the required gamut mapping tables - most ICC profiles do not, and in those cases "relative colorimetric" will be silently used instead (this is standard behavior across most software). Similar to relative colorimetric, but the white point will not be corrected. For this reason, it is used when you want to match paper whiteness to screen. You might want to use it when proofing, but not otherwise. When enabled, the Black Point level of the input image is moved to the Black Point level of the output image in a color transformation (e.g. from working profile to display profile). It means that the luminance channel alone is compressed or expanded to match the output capabilities. This feature will keep details in the shadows (avoid flat dark areas) at the expense of less color correctness. Batch editing is making adjustments to more than one image at the same time. This is done through the Batch Edit tab in the File Browser. [-] Values differ across selected images. Batch editing is done by selecting multiple images in the File Browser (hold the ⇧ Shift or ^ Ctrl key, then click the images you want to select), then you can edit those images using the tools in the Batch Edit panel on the right. The controls (sliders, spinboxes, etc.) in the Batch Edit panel show the values of the processing parameters for the selected images. These can be the values of the default processing profile or the values from your last edit session of those photos. If an image is currently being edited in the Editor, the editor's values will be reflected in real time in the Batch Edit panel, and vice versa, so take care what you're doing. What happens to the tool values as you manipulate them depends on the "Behavior" setting in this Batch Edit tab. This mode may also be understood as "relative". Modifying sliders which are set to the "Add" mode will result in the value of the modification being added to the existing value. For example, if you select two images by holding the Ctrl modifier key, one image which has an Exposure#Exposure_Compensation Exposure Compensation of -0.5 EV and the other which has +1.0 EV, moving the "Exposure Compensation" slider up to +0.3 will result in setting a value of -0.2 EV for the first image and +1.3 EV for the second one. Using the "Reset" button will move the slider to its default (zero) position and will then bring back the initial value of that slider for each selected image. This mode may also be understood as "absolute". Modifying sliders which are set to the "Set" mode will result in the value of the modification being set, irrelevant of what the existing value was. If we use the same example as before, moving the slider up to +0.3 EV will result in setting a value of +0.3 EV for both images (one value for all images). Using the 'Reset' button will move the slider to its default position (different for each slider), and will then reset this parameter for each image. The "Performance" tab is only for people who know what they're doing. It lets you poke under the hood and tweak some parameters depend on available RAM and CPU speed. The "Demosaicing method used for the preview at <100% zoom" option sets which demosaicing method is used for the main preview in the Editor. By default, the same demosaicing method is used as specified in the Demosaicing section of the Raw tab, but if you are on a a very slow computer you can save a few hundred milliseconds by using the "Fast" demosaicing method. The trade-off is that the "Fast" method has the worst quality, though in most cases the difference is slight. "Serialize read of TIFF files", enabled by default, can speed up thumbnail generation when opening for the first time a folder full of uncompressed TIFF files. The "Maximum number of cached CLUTs" setting lets you specify how many last-used HaldCLUT (Film Simulation) images are stored in RAM for faster access when switching back and forth between them in the Editor. Most raw files contain an embedded JPEG preview image. To show that image in the Inspect tab it needs to be extracted, which takes a fraction of a second. The "Maximum number of cached images" setting lets you specify how many of the last-viewed embedded images are kept in RAM, so that if you view the previous image in the Inspect tab, RawTherapee will not need to re-extract it, but just access it from RAM. The "Image to show" option lets you decide whether to use the embedded JPEG image or to render one based on the real raw data using the "Neutral" processing profile. Using the embedded image is faster than rendering from the real raw data. Splitting calculations and running them as concurrent threads allows them to complete faster, however doing so requires more RAM. By default, RawTherapee decides automatically how many threads to use. You can override this value here. Most modern CPUs run two threads per physical core. Find out what CPU you have and how many cores it has, multiply that number by two, and you get the maximum number of threads it would make sense to run simultaneously. Let's call this number Tmax. You would not benefit from running more threads than this - in fact you would likely suffer a small speed penalty. Setting this parameter to "0" will let your CPU figure out what Tmax is, and use that. If you experience crashes due to insufficient RAM, then you can calculate Tmax yourself and use a number lower than that. The "Sounds" tab lets you set an audible notification when a lengthy operation ends. It is currently only supported on Windows and Linux. The "Queue processing done" sound is played after the last Queue image finishes processing. The "Editor processing done" sound is played after a lengthy in-editor operation that took longer than the specified number of seconds is complete. Sounds can be muted either by disabling the "Enabled" checkbox or by setting fields with sound file references to blank values. possibly the name of any file in /usr/share/sounds/freedesktop/stereo/ without the path or extension.